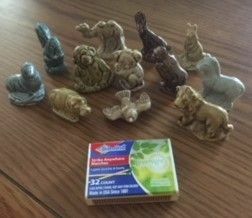 These little porcelain figures were free inside boxes of Red Rose Tea. Made in Wade England, the bottoms were ridged to provide a place to strike a match, hence sometimes referred to as strikers. I found a box of them and was wondering if anyone had any to trade or sell. I may keep my collection or part with it for good reason.